Railway Power Storage System｜Products Information｜Toyo Denki Seizo K.K. Providing environmentally friendly solutions is one of the highest priorities in the world today. The train industry consumes a great deal of electricity. Therefore, any solution that can help reduce the amount of electricity consumed can go a long way toward improving the environment. Also, nowadays, where power shortages have become common place, solutions that help save energy will also help ensure stable train operations. In response to these concerns, Toyo Denki has developed a solution for recycling regenerative power. Called the E3 Solution System, it involves the use of large capacity lithium ion batteries for large current, rapid charge/discharge and high-performance DC/DC converters to control charging and discharging in a timely manner without any waste. It also prevents regeneration loss, provides voltage drop compensation, and executes peak cuts at transformer substations. 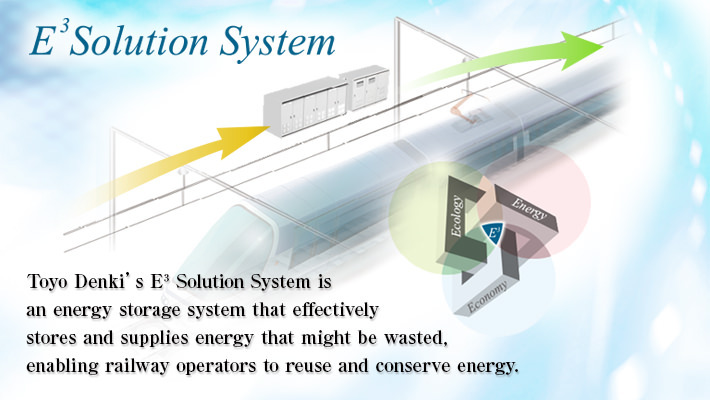 The E3 Solution System is built around the concept that “recycling power is better than wasting it” and ensures that regenerative power is effectively used to provide for stable train operations. Toyo Denki invites you to consider the E3 Solution System. If a train that is regenerating power is on a line that has no trains to give that power to, then the voltage of the overhead power lines will rise, resulting in regeneration loss. This problem becomes increasingly severe as the number of trains regenerating power on the same line increases. Left as is, the regenerative power will get consumed by heat, etc. The E3 Solution System, however, can effectively store surplus regenerative power and supply it to other trains that can put it to use. The further away a train is from transformer substation, the more the voltage of the overhead power lines will fall. Also, the more trains are in service during peak hours, the greater this voltage drop will be. The E3 Solution System can be installed in such areas where voltage drops occur in order to reduce the drop in voltage. Rush hour operations in the morning and evening when electric power hits peak usage can result in a significant increase in electricity costs. Also, every year transportation capacity increases, making it necessary to add more and more transformer substations. The E3 Solution System reduces the amount of power consumed during peak hours, whereby reducing the need for such contracted electricity.